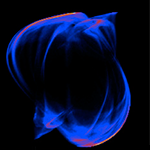 Authors: Hagerstrom, A. M.; Murphy, T. E.; Roy, R.
Abstract: Many physical processes, including the intensity fluctuations of a chaotic laser, the detection of single photons, and the Brownian motion of a microscopic particle in a fluid are unpredictable, at least on long timescales. This unpredictability can be due to a variety of physical mechanisms, but it is quantified by an entropy rate. This rate, which describes how quickly a system produces new and random information, is fundamentally important in statistical mechanics and practically important for random number generation. We experimentally study entropy generation and the emergence of deterministic chaotic dynamics from discrete noise in a system that applies feedback to a weak optical signal at the single-photon level. We show that the dynamics transition from shot noise to chaos as the photon rate increases and that the entropy rate can reflect either the deterministic or noisy aspects of the system depending on the sampling rate and resolution.